Molecular model of ATP synthase determined by X-ray crystallography. Stator is not shown here. The formation of ATP from ADP and Pi is energetically unfavorable and would normally proceed in the reverse direction. In order to drive this reaction forward, ATP synthase couples ATP synthesis during cellular respiration to an electrochemical gradient created by the difference in proton (H+) concentration across the mitochondrial membrane in eukaryotes or the plasma membrane in bacteria. During photosynthesis in plants, ATP is synthesized by ATP synthase using a proton gradient created in the thylakoid lumen through the thylakoid membrane and into the chloroplast stroma. ATP synthase consists of two main subunits, FO and F1, which has a rotational motor mechanism allowing for ATP production. Because of its rotating subunit, ATP synthase is a molecular machine. The F1 fraction derives its name from the term "Fraction 1" and FO (written as a subscript letter "o", not "zero") derives its name from being the binding fraction for oligomycin, a type of naturally-derived antibiotic that is able to inhibit the FO unit of ATP synthase. These functional regions consist of different protein subunits — refer to tables. This enzyme is used in synthesis of ATP through aerobic respiration. Bovine mitochondrial ATP synthase. The FO, F1, axle, and stator regions are color coded magenta, green, orange, and cyan respectively. Simplified model of FOF1-ATPase alias ATP synthase of E. coli. Subunits of the enzyme are labeled accordingly. 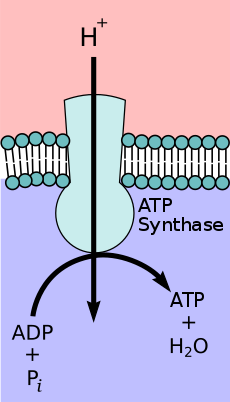 Rotation engine of ATP synthase. subunits. F1 has a water-soluble part that can hydrolyze ATP. FO on the other hand has mainly hydrophobic regions. FO F1 creates a pathway for protons movement across the membrane. make a hexamer with 6 binding sites. Three of them are catalytically inactive and they bind ADP. to go through conformational changes, i.e. closed, half open and open states allows for ATP to be bound and released once synthesized. The F1 particle is large and can be seen in the transmission electron microscope by negative staining. These are particles of 9 nm diameter that pepper the inner mitochondrial membrane. FO subunit F6 from the peripheral stalk region of ATP synthase. FO is a water insoluble protein with eight subunits and a transmembrane ring. The ring has a tetramer shape with a helix loop helix protein that goes though conformational changes when protonated and deprotonated, pushing neighboring subunits to rotate, causing the spinning of FO which then also affects conformation of F1, resulting in switching of states of alpha and beta subunits. The FO region of ATP synthase is a proton pore that is embedded in the mitochondrial membrane. It consists of three main subunits, a, b, and c, and (in humans) six additional subunits, d, e, f, g, F6, and 8 (or A6L). An atomic model for the dimeric yeast FO region was determined by cryo-EM at an overall resolution of 3.6 Å. This part of the enzyme is located in the mitochondrial inner membrane and couples proton translocation to the rotation the causes ATP synthesis in the F1 region. Mechanism of ATP synthase. ADP and Pi (pink) shown being combined into ATP (red), and the rotating γ (gamma) subunit in black causing conformation. Depiction of ATP synthase using the chemiosmotic proton gradient to power ATP synthesis through oxidative phosphorylation. In the 1960s through the 1970s, Paul Boyer, a UCLA Professor, developed the binding change, or flip-flop, mechanism theory, which postulated that ATP synthesis is dependent on a conformational change in ATP synthase generated by rotation of the gamma subunit. The research group of John E. Walker, then at the MRC Laboratory of Molecular Biology in Cambridge, crystallized the F1 catalytic-domain of ATP synthase. The structure, at the time the largest asymmetric protein structure known, indicated that Boyer's rotary-catalysis model was, in essence, correct. For elucidating this, Boyer and Walker shared half of the 1997 Nobel Prize in Chemistry. The crystal structure of the F1 showed alternating alpha and beta subunits (3 of each), arranged like segments of an orange around a rotating asymmetrical gamma subunit. According to the current model of ATP synthesis (known as the alternating catalytic model), the transmembrane potential created by (H+) proton cations supplied by the electron transport chain, drives the (H+) proton cations from the intermembrane space through the membrane via the FO region of ATP synthase. A portion of the FO (the ring of c-subunits) rotates as the protons pass through the membrane. The c-ring is tightly attached to the asymmetric central stalk (consisting primarily of the gamma subunit), causing it to rotate within the alpha3beta3 of F1 causing the 3 catalytic nucleotide binding sites to go through a series of conformational changes that lead to ATP synthesis. The major F1 subunits are prevented from rotating in sympathy with the central stalk rotor by a peripheral stalk that joins the alpha3beta3 to the non-rotating portion of FO. The structure of the intact ATP synthase is currently known at low-resolution from electron cryo-microscopy (cryo-EM) studies of the complex. The cryo-EM model of ATP synthase suggests that the peripheral stalk is a flexible structure that wraps around the complex as it joins F1 to FO. Under the right conditions, the enzyme reaction can also be carried out in reverse, with ATP hydrolysis driving proton pumping across the membrane. The binding change mechanism involves the active site of a β subunit's cycling between three states. In the "loose" state, ADP and phosphate enter the active site; in the adjacent diagram, this is shown in pink. The enzyme then undergoes a change in shape and forces these molecules together, with the active site in the resulting "tight" state (shown in red) binding the newly produced ATP molecule with very high affinity. Finally, the active site cycles back to the open state (orange), releasing ATP and binding more ADP and phosphate, ready for the next cycle of ATP production. Like other enzymes, the activity of F1FO ATP synthase is reversible. Large-enough quantities of ATP cause it to create a transmembrane proton gradient, this is used by fermenting bacteria that do not have an electron transport chain, but rather hydrolyze ATP to make a proton gradient, which they use to drive flagella and the transport of nutrients into the cell. In respiring bacteria under physiological conditions, ATP synthase, in general, runs in the opposite direction, creating ATP while using the proton motive force created by the electron transport chain as a source of energy. The overall process of creating energy in this fashion is termed oxidative phosphorylation. The same process takes place in the mitochondria, where ATP synthase is located in the inner mitochondrial membrane and the F1-part projects into the mitochondrial matrix. The consumption of ATP by ATP-synthase pumps proton cations into the matrix. The evolution of ATP synthase is thought to have been modular whereby two functionally independent subunits became associated and gained new functionality. This association appears to have occurred early in evolutionary history, because essentially the same structure and activity of ATP synthase enzymes are present in all kingdoms of life. The F-ATP synthase displays high functional and mechanistic similarity to the V-ATPase. However, whereas the F-ATP synthase generates ATP by utilising a proton gradient, the V-ATPase generates a proton gradient at the expense of ATP, generating pH values of as low as 1. -powered flagellar motor complexes. The α3β3 hexamer of the F1 region shows significant structural similarity to hexameric DNA helicases; both form a ring with 3-fold rotational symmetry with a central pore. Both have roles dependent on the relative rotation of a macromolecule within the pore; the DNA helicases use the helical shape of DNA to drive their motion along the DNA molecule and to detect supercoiling, whereas the α3β3 hexamer uses the conformational changes through the rotation of the γ subunit to drive an enzymatic reaction. potential gradient as an energy source. This link is tenuous, however, as the overall structure of flagellar motors is far more complex than that of the FO particle and the ring with about 30 rotating proteins is far larger than the 10, 11, or 14 helical proteins in the FO complex. motor in reverse. This may have evolved to carry out the reverse reaction and act as an ATP synthase. E. coli ATP synthase is the simplest known form of ATP synthase, with 8 different subunit types. Yeast ATP synthase is one of the best-studied eukaryotic ATP synthases; and five F1, eight FO subunits, and seven associated proteins have been identified. Most of these proteins have homologues in other eukaryotes. In plants, ATP synthase is also present in chloroplasts (CF1FO-ATP synthase). The enzyme is integrated into thylakoid membrane; the CF1-part sticks into stroma, where dark reactions of photosynthesis (also called the light-independent reactions or the Calvin cycle) and ATP synthesis take place. The overall structure and the catalytic mechanism of the chloroplast ATP synthase are almost the same as those of the bacterial enzyme. However, in chloroplasts, the proton motive force is generated not by respiratory electron transport chain but by primary photosynthetic proteins. The ATP synthase isolated from bovine (Bos taurus) heart mitochondria is, in terms of biochemistry and structure, the best-characterized ATP synthase. Beef heart is used as a source for the enzyme because of the high concentration of mitochondria in cardiac muscle. ATP10 protein required for the assembly of the FO sector of the mitochondrial ATPase complex. ^ Okuno D, Iino R, Noji H (April 2011). "Rotation and structure of FOF1-ATP synthase". Journal of Biochemistry. 149 (6): 655–64. doi:10.1093/jb/mvr049. PMID 21524994. ^ Junge W, Nelson N (June 2015). "ATP synthase". Annual Review of Biochemistry. 84: 631–57. doi:10.1146/annurev-biochem-060614-034124. PMID 25839341. -ATPases and ATP synthases". The Journal of Experimental Biology. 172 (Pt 1): 431–441. PMID 9874753. ^ PDB: 5ARA​; Zhou A, Rohou A, Schep DG, Bason JV, Montgomery MG, Walker JE, Grigorieff N, Rubinstein JL (October 2015). "Structure and conformational states of the bovine mitochondrial ATP synthase by cryo-EM". eLife. 4: e10180. doi:10.7554/eLife.10180. PMC 4718723. PMID 26439008. ^ Goodsell D (December 2005). "ATP Synthase". Molecule of the Month. doi:10.2210/rcsb_pdb/mom_2005_12. ^ a b Velours J, Paumard P, Soubannier V, Spannagel C, Vaillier J, Arselin G, Graves PV (May 2000). "Organisation of the yeast ATP synthase F(0):a study based on cysteine mutants, thiol modification and cross-linking reagents". Biochimica et Biophysica Acta. 1458 (2–3): 443–56. doi:10.1016/S0005-2728(00)00093-1. PMID 10838057. ^ PDB: 1VZS​; Carbajo RJ, Silvester JA, Runswick MJ, Walker JE, Neuhaus D (2004). "Solution structure of subunit F(6) from the peripheral stalk region of ATP synthase from bovine heart mitochondria". Journal of Molecular Biology. 342 (2): 593–603. doi:10.1016/j.jmb.2004.07.013. PMID 15327958. ^ Guo H, Bueler SA, Rubinstein JL (Nov 2017). "Atomic model for the dimeric FO region of mitochondrial ATP synthase". Science. 358 (6365): 936–40. Bibcode:2017Sci...358..936G. doi:10.1126/science.aao4815. PMID 29074581. ^ Gresser MJ, Myers JA, Boyer PD (October 1982). "Catalytic site cooperativity of beef heart mitochondrial F1 adenosine triphosphatase. Correlations of initial velocity, bound intermediate, and oxygen exchange measurements with an alternating three-site model". The Journal of Biological Chemistry. 257 (20): 12030–8. PMID 6214554. ^ Nakamoto RK, Baylis Scanlon JA, Al-Shawi MK (August 2008). "The rotary mechanism of the ATP synthase". Archives of Biochemistry and Biophysics. 476 (1): 43–50. doi:10.1016/j.abb.2008.05.004. PMC 2581510. PMID 18515057. ^ a b c d Doering C, Ermentrout B, Oster G (December 1995). "Rotary DNA motors". Biophysical Journal. 69 (6): 2256–67. Bibcode:1995BpJ....69.2256D. doi:10.1016/S0006-3495(95)80096-2. PMC 1236464. PMID 8599633. ^ a b Crofts A. "Lecture 10:ATP synthase". Life Sciences at the University of Illinois at Urbana–Champaign. ^ a b c "ATP Synthase". InterPro Database. ^ Beyenbach, KW; Wieczorek, H (Feb 2006). "The V-type H+ ATPase: molecular structure and function, physiological roles and regulation". J Exp Biol. 209 (4): 577–89. doi:10.1242/jeb.02014. PMID 16449553. ^ a b Martinez LO, Jacquet S, Esteve JP, Rolland C, Cabezón E, Champagne E, Pineau T, Georgeaud V, Walker JE, Tercé F, Collet X, Perret B, Barbaras R (January 2003). "Ectopic beta-chain of ATP synthase is an apolipoprotein A-I receptor in hepatic HDL endocytosis". Nature. 421 (6918): 75–79. Bibcode:2003Natur.421...75M. doi:10.1038/nature01250. PMID 12511957. ^ Cross RL, Taiz L (January 1990). "Gene duplication as a means for altering H+/ATP ratios during the evolution of FOF1 ATPases and synthases". FEBS Letters. 259 (2): 227–9. doi:10.1016/0014-5793(90)80014-a. PMID 2136729. ^ Cross RL, Müller V (October 2004). "The evolution of A-, F-, and V-type ATP synthases and ATPases: reversals in function and changes in the H+/ATP coupling ratio". FEBS Letters. 576 (1–2): 1–4. doi:10.1016/j.febslet.2004.08.065. PMID 15473999. ^ Ahmad Z, Okafor F, Laughlin TF (2011). "Role of Charged Residues in the Catalytic Sites of Escherichia coli ATP Synthase". Journal of Amino Acids. 2011: 1–12. doi:10.4061/2011/785741. PMC 3268026. PMID 22312470. ^ Devenish RJ, Prescott M, Roucou X, Nagley P (May 2000). "Insights into ATP synthase assembly and function through the molecular genetic manipulation of subunits of the yeast mitochondrial enzyme complex". Biochimica et Biophysica Acta. 1458 (2–3): 428–42. doi:10.1016/S0005-2728(00)00092-X. PMID 10838056. ^ Kabaleeswaran V, Puri N, Walker JE, Leslie AG, Mueller DM (November 2006). "Novel features of the rotary catalytic mechanism revealed in the structure of yeast F1 ATPase". The EMBO Journal. 25 (22): 5433–42. doi:10.1038/sj.emboj.7601410. PMC 1636620. PMID 17082766. ^ Stock D, Leslie AG, Walker JE (November 1999). "Molecular architecture of the rotary motor in ATP synthase". Science. 286 (5445): 1700–5. doi:10.1126/science.286.5445.1700. PMID 10576729. ^ Liu S, Charlesworth TJ, Bason JV, Montgomery MG, Harbour ME, Fearnley IM, Walker JE (May 2015). "The purification and characterization of ATP synthase complexes from the mitochondria of four fungal species". Biochemical Journal. 468 (1): 167–175. doi:10.1042/BJ20150197. PMC 4422255. PMID 25759169. ^ Abrahams JP, Leslie AG, Lutter R, Walker JE (August 1994). "Structure at 2.8 A resolution of F1-ATPase from bovine heart mitochondria". Nature. 370 (6491): 621–8. Bibcode:1994Natur.370..621A. doi:10.1038/370621a0. PMID 8065448. ^ Gibbons C, Montgomery MG, Leslie AG, Walker JE (November 2000). "The structure of the central stalk in bovine F(1)-ATPase at 2.4 A resolution". Nature Structural Biology. 7 (11): 1055–61. doi:10.1038/80981. PMID 11062563. ^ Menz RI, Walker JE, Leslie AG (August 2001). "Structure of bovine mitochondrial F(1)-ATPase with nucleotide bound to all three catalytic sites: implications for the mechanism of rotary catalysis". Cell. 106 (3): 331–41. doi:10.1016/s0092-8674(01)00452-4. PMID 11509182. Boris A. Feniouk: "ATP synthase — a splendid molecular machine"
Well illustrated ATP synthase lecture by Antony Crofts of the University of Illinois at Urbana–Champaign. David Goodsell: "ATP Synthase- Molecule of the Month"